Caught midway between the “greatest generation” and its boomer offspring, Joe Lewis straddles two disparate cultures and embodies a variety of contradictory roles. Backwards Over is a three-part chronicle of Joe’s restless journey through America of the 1960s, 70s, and 80s. Scenes range from a cotton-field juke joint in rural Texas to a fiery Harvard Square riot, with stops along the way in Austin, Naples, Colorado, and rural Maine. Backwards Over is W. Royal Stokes’ first work of fiction. A jazz writer for three decades, W. Royal Stokes has a special talent for capturing the initial spark that launches a musician’s career. In Growing Up With Jazz , he has interviewed twenty-four instrumentalists and singers who talk candidly about the early influences that started them on the road to jazz and where that road has taken them. A seasoned jazz critic draws on his interviews of forty musicians, from Slide Hampton and Bucky Pizzarelli to Dee Dee Bridgewater and Diana Krall, illuminating their lives, careers, and art. 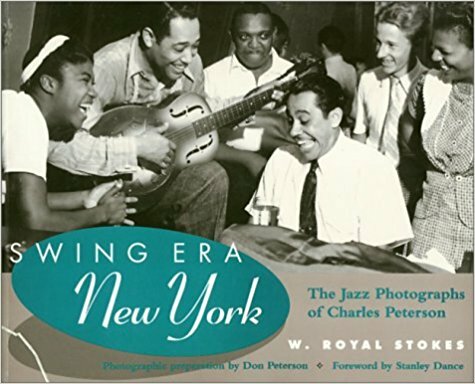 Charles Peterson entered the jazz world of New York as a guitarist but made his true contribution documenting an era and its most notable performers. Peterson took up the camera in the mid-1930s and transformed himself from a performer on stage to a visual recorder and observer of the stage. Jazz historian and critic W. Royal Stokes provides commentary, historical and biographical information, and lively anecdotes that connect the musicians featured in these photos. No one can tell us more about jazz than the musicians themselves. Unfortunately, most oral histories have limited scope–focusing on a particular era or style–and fail to capture the full, rich story of jazz. Now, in this vivid oral history, W. Royal Stokes presents nearly a century of jazz–its people, places, periods, and styles–as it was seen by the artists who created America’s most distinctive music.